Scorpio April 2015 Horoscope predicts that your social skills and charm will work during April 2015 while independence and aggression will fail. You have to adapt yourself to the changing environment and people. Ask friends for help to achieve your objectives. Up to the third week of the month, planetary influence is in the lower half of the birth chart. Psychological stability and family concerns will rule. There is a change in the strength of planets to the upper half after 20th, and career and personal achievements will take over. The Scorpio April 2015 astrology forecasts show that your career will see progress this month. Your efforts to achieve the same degree of success will be minimal compared to earlier times. Your colleagues will be supportive of your hard work. Know more the 2015 Rashi predictions. The financial predictions for April 2015 foretell that the monetary situation will be positive and cash will flow from various sources. There will be sudden in flow of money from new sources for the Scorpio zodiac sign. Speculative dealings should be done before 20th. Also get the horoscopes for May 2015. Many opportunities for forging new love relationships arise during the month for the Scorpio. Love will be more for fun, and serious commitment is lacking. You may find love in the work place. If you are planning to have a baby, try this Chinese baby gender predictor. 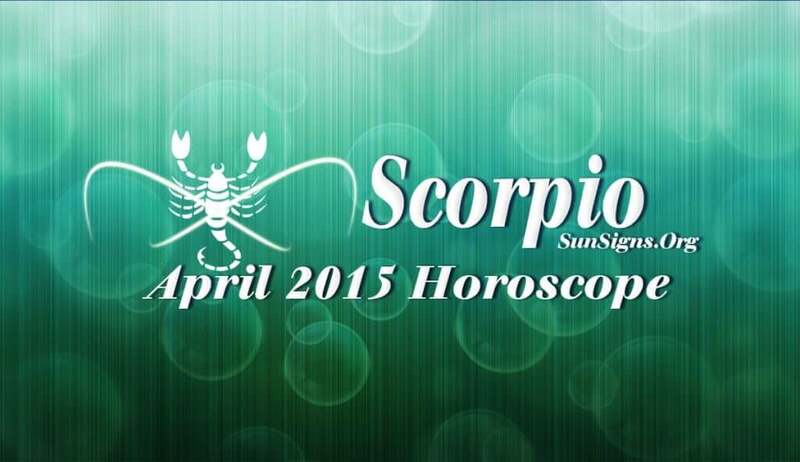 The Scorpio horoscope for April 2015 forecasts that your health will be satisfactory till the third week of the month. There is a risk of diabetes if you become indulgent with your eating habits.